Now in its 23rd year, NXNE returns to take over Toronto June 10 – 25, 2017! This year’s festival will feature Game Land, one of the largest eSports events in Canada, Club Land, a concert series curated by leading Canadian musicians, and Port Lands, a three day festival by the lake June 23 – 25. 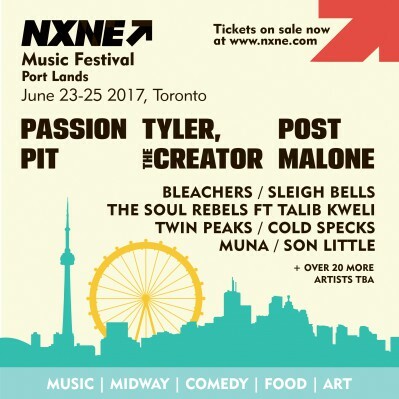 The first wave of NXNE Port Lands artists has been announced, and includes the likes of chart-topping indietronica act Passion Pit, multi-talented rapper and producer Tyler, the Creator, genre-bending hip hop artist Post Malone and more! With so many great indie and hip hop artists playing the Port Lands Festival, we thought we’d take you on a musical tour of this year’s lineup. Listen to tracks from each artist below. No guarantees they won’t get stuck in your head! Boston, Massachusetts-based Passion Pit began as a one-man project of singer/songwriter Michael Angelakos to produce a Valentine’s Day gift for his girlfriend. Since then, Passion Pit has released 5 albums, and had countless indie pop hits including Sleepyhead, Carried Away, Take a Walk and more. This year, Passion Pit has steadily been releasing tracks online for the new album Tremendous Sea of Love, with Angelakos announcing that he will give a downloadable copy of the album for free to anyone who re-tweets neuroscientist Michael F. Wells’ tweet on the importance of science and research. Tyler, the Creator caught the world’s attention in a big way in 2010. As the founder of Odd Future, his early notoriety came from his raw, DIY approach to the music business along with his wildly energetic and now infamous live shows, though he has since emerged as one of the most compelling creatives of his generation. Post Malone stirs a mix of genres into his own sonic “sauce” that’s both intoxicating and invigorating. “You can turn up to it. You can chill to it. You can do anything to it. It makes you feel some type of way, or it makes you want to party. It just comes naturally.” Post Malone’s recipe has yielded massive success so far. His breakthrough single “White Iverson” reached RIAA triple-platinum status, captured #1 at Rhythm Radio, and soared to the Top 10 of Urban Radio. Sleigh Bells wasted no time after getting off the ground in 2009, releasing three blistering records in four years. Ready for a break from the road, they took their time on their fourth LP, 2016’s Jessica Rabbit. The noise pop duo from Brooklyn, New York are known for their high energy performances, so get ready to move at Port Lands 2017! The Soul Rebels started with an idea – to expand upon the pop music they loved on the radio and the New Orleans brass tradition they grew up on. They took that tradition and blended funk and soul with elements of hip hop, jazz and rock. Riding high into 2016 after touring four continents, selling out shows, collaborating live with artists like Macklemore & Ryan Lewis, Marilyn Manson and opening for Bruno Mars, The Soul Rebels will perform with Talib Kweli at Port Lands 2017. The Brooklyn-based MC earned his stripes as one of the most lyrically-gifted, socially aware and politically insightful rappers to emerge in the last 20 years. After nearly two decades of releasing mesmerizing music, Talib Kweli stands as one of the world’s most talented and most accomplished hip hop artists. Whether working with Most Def as one-half of Black Star, partnering with producer Hi-Tek for Reflection Eternal, releasing landmark solo material or collaborating with Kanye West, Pharrell Williams, Just BLaze, J Dilla or Madlip, Kweli commands attention by delivering top-tier lyricism, crafting captivating stories and showing the ability to rhyme over virtually any type of instrumental. Hailing from Chicago Illinois, this indie rock band lists its influences as T. Rex, The Rolling Stones and The Kinks. The five band members formed Twin Peaks while all were still in high school, and have gone on to record three albums and tour extensively across North America. Currently in the studio completing her third album, local act Cold Specks has been a byword for rare talent and depth of feeling since her arrival in late 2001. Her 2012 debut album I Predict a Graceful Expulsion! was hailed as a masterful and wholly original debus and was shortlisted for a Juno award and Polaris Prize. Cold Specks’ sophomore album Neuroplasticity was voted one of The Wall Street Journal and Los Angeles Times’ albums of the year. Band to watch MUNA is a dark pop girl group based in Los Angeles, CA blending the brooding sensuality of R&B, rhythms of funk, and audacity of synthpop with raw, unbridled lyricism. Fresh off an incredible SXSW performance, they hope their songs lend themselves both to the euphoric dancefloor and emo bedroom solitude. The artist formerly known as Aaron Livingston knows his nation well. Born to a preacher and a teacher in Los Angeles, he dropped in and out of schools in Manhattan then Philadelphia where he collaborated with acts like The Roots and RJD2. He first planted his flag as Son Little with last year’s highly praised EP, Things I Forgot, a small collection of big songs that showcased his ability to hop across genres as well as he does state lines.